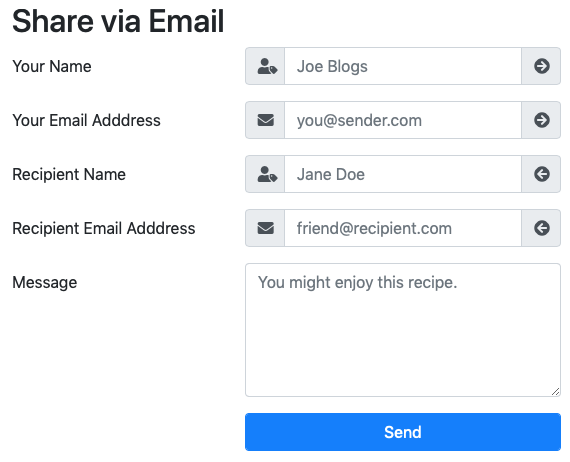 The challenge was quite simple — improve the two forms added to the recipe page we have been building up over the past many instalments by making use of input groups. Let’s start with the small admin login form in the footer. My starting point was a simple inline form with a label for the overall form, two inputs, each with a hidden label, and a button. I chose to combine all three form elements into a single input group, and to give that input group an appropriate icon as a prefix. I started by simplifying the form and removing all the labels and replacing them with aria-label attributes on the form’s container and each of the inputs. This simplified the markup without compromising accessibility. With the <label> tags removed I then wrapped all three elements in <span> with the classes input-group & input-group-sm and removed the spacing utility classes and form-control-sm/btn-sm classes from the individual inputs and the button. At this point I had three equal-width elements in my group, the username field, the password field, and the login button. To demote the button from a full-member of the input group requiring an equal share of the width to an append I wrapped the button in a <span> with the class input-group-append. Finally I added an icon to the front of the input group by inserting a <span> with the class input-group-prepend as the first element within the input group. Next I added another <span> with the class input-group-text within prepend, a finally a Font Awesome icon within that. The second form needed much less work. I simply converted the four text boxes to input groups with single text add-ons front and back, and a single Font Awesome icon in each. I used the appends to signify whether or not the field applied to the sender of the receiver with the use of arrow icons, and the prepend to signify the expect value in the field with an icon for name, and another for email. The only mildly interesting thing I did was to force all the prepends and appends to be the exact same width by explicitly setting it to 2.5em with an inline style attribute on the <span> with the class input-group-text. You can find my full sample solution in the pbs65-challenge-solution folder in “>this instalment’s ZIP file. We learned about HTML5’s built-in form validation features back in instalments 39 & 40. Given that previous versions of HTML had no form validation at all, these new built-in features are a great leap forward, but, they are far from perfect. Each browser implements the built-in validation messages differently, and they can’t be styled with CSS. We’ll work our way from one end of the spectrum to the other with a worked example. We’ll use an updated version of the sample donation form from the previous instalment as our starting point. You’ll find this file in this instalment’s ZIP as pbs66a.html. The key points to note about this file are that I have added the relevant HTML5 form validation attributes to the form elements. Specifically I’ve added the flag attribute required to the required fields, and min=1 to the amount field. Note that the text boxes already had the appropriate HTML5 type attributes, if not, I would have had to update the amount text box to type="number" and URL text box to type="url". If you load this page in a browser you can remind yourself how standard HTML5 form validation presents itself. Back in instalment 39 we learned that HTML5 provides us with two CSS pseudo-classes that we can use to style form elements depending on their validity, i.e. invalid form elements have the pseudo-class :invalid, and valid ones get :valid. Unsurprisingly, Bootstrap has built-in styling for form validation states. Like with other opinionated Bootstrap styling, you have to opt into these styles by adding the class .was-validated to the form. Now, every valid form element gets a green border, and every invalid one a red border. You can see this in action in pbs66b.html in this instalment’s ZIP. Having a form you haven’t even touched already be visually cranky at you with lots of red borders is sub-optimal. A nice improvement would be to have the Bootstrap validation states only show up when the form is first submitted. We can do this by not adding the class .was-validated into the form in our markup, but adding it via appropriate event handlers later. The two relevant event handlers are the forms submit handler, and each validated form element’s invalid handler. You might imagine just the form’s submit handler might be enough, but you’d soon find that doesn’t work, because that handler only fires when the form passes validation. The invalid event is fired when ever validation fails on a given element, so we need to catch that event too. We can see this in action in pbs66c.html from this instalment’s ZIP. The additional code first saves a reference to a jQuery object representing the form to a variable named $form. Next the code defines a function named enableBootstapValiationStyles() which simply adds the class .was-validated to the form. Finally, the additional codes adds this function as a handler for the form’s submit event, and as a handler to each input within the form’s invalid event. Remember, when you pass the $() function a CSS selector as the first argument and a jQuery object as the second, it returns a jQuery object representing all elements matching the selector contained within the elements represented by the second argument. In this case $('input', $form) means all input tags within our form. The final step is to take full control and remove the standard HTML5 UI completely, and replace it with custom Bootstrap UI. The first thing we have to do to enable this is tell HTML5 not to show its built-in validation messages by adding the flag attribute novalidate to the <form>. Doing this will not prevent the browser from doing the validation, so the :valid and :invalid pseudo-classes will continue to exist and be updated, but it will prevent the browser from showing validation feedback, and even invalid forms will now submit. With those two piece of jQuery knowledge fresh in our minds agin, let’s now look at the tools Bootstrap provides us. Because Bootstrap’s default behaviour is to only show form validity styling when the form has the class .was-validated, by default either all the fields within a form get styled, or none. That’s not always the desired behaviour, so Bootstrap also provides the classes .is-valid & .is-invalid which can be applied to individual form elements to cause them to show their styling regardless of the presence or absence of .was-validated on their containing <form>. Bootstrap also gives us pre-made styles for showing validation success and failure messages. Specifically, it provides .valid-feedback & .invalid-feedback. Both of these classes are hidden by default. For simple forms that have the .was-validated class you can have these messages automatically show and hide themselves by placing a <div> with the relevant class either directly after a regular form element, or as the last children within an input group. Alternatively, you can manually show and hide these messages using jQuery’s .show() and .hide() functions. To see all this in action, let’s look at a final version of our form with fully custom validation using Bootstrap’s styles. I’ve chosen to enable validation on each field in the form one-by-one as its interacted with, and not to enable form-wide validation until the first time the form is submitted. I think this approach gives the most pleasing user experience. You can try it for yourself with pbs66d.html in the ZIP. A <div> with an ID has been added after each input that needs validation. This <div> will be used to display any needed feedback. The validation functions are configured as handlers for the input event on their relevant text boxes. The checkbox related to the URL field has the URL field’s validation function attached to its change hander. The form as a whole has a submit handler that calls each validation function and enables form-wide validation by adding .was-validated to the form as a whole. As a courtesy to the user, the submit handler also focuses the first invalid element in the form. You can see the full source in pbs66d.html, but I want to draw your attention to some specific examples. Note the use of .is(':valid') to test for validity, the use of .addClass() and .removeClass() for alternating between the .is-valid and .is-invalid classes on the two text boxes, and the use of .hide() and .show() on the error message. This get marginally more complicated on fields where we want to show both success and error messages, but not much. Let’s look at the amount field as an example. In this case we have just a single text box, but we what to thank people when they enter a valid amount, and give them an error message when they enter an invalid amount. Like in our previous example .is(':valid') is used to check the validity, .addClass() & .removeClass() are used to update the classes. and .show() is used to show the message. In addition to this we’re now using .val() to read the text box’s value, and .text() to update the feedback text. One additional complication is optional fields. In this case there are three scenarios, an invalid value, and two possible valid conditions, no value, and a valid value. When there is no value the input is in a valid state, but we don’t want to display our success message, instead, we want to display no message at all. Notice the use of .empty() to empty the feedback <div> as needed. Finally, there is the form submission event hander. This handler first enables validation feedback on the entire form. Next it calls all the validation functions to determine whether or not the form as a whole should be considered valid, and then it either blocks form submission, or pretend-submits the form (since it’s a dummy form). As a courtesy to users, the handler also focuses the first invalid field when there is one. Notice the use of .first() and .focus() in conjunction with the $() function to focus the first invalid input within the form. We are calling the $() function with two arguments, a CSS selector and jQuery object, so the result of that call will be a jQuery object representing all elements matching the selector within the elements represented by the second argument. In this case, all <input> tags with the pseudo-class :invalid contained within our form. This will result in a jQuery object representing all invalid text boxes, but we can only focus one, so the call to .first() returns a new jQuery object representing only the first invalid text box. Finally, .focus() focuses that single text box. We’ll yet again be building on the output from the previous challenge for this one. You can use your own solution as your starting point, or my sample solution. Update the two forms on the page to add form validations of your choice. For bonus credit, find the documentation for Bootstrap form validation tooltips and use those for the login form. We’ve not completed our first look at Bootstrap’s form-related features. We’re now ready to move on to a related but subtly different set of Bootstrap features — web app UI elements.